Co-hosted by the Park City Women&apos;s Business Network, join us for a lunch and learn to improve your financial future! Bring your lunch (dessert will be provided!!) and enjoy an insightful seminar on retirement planning for small business owners. Selecting the right retirement plan for your business is a crucial step. There are many retirement options for a small business, a sole proprietor or a partnership and this seminar will address all of the options available and the advantages of each. Kathleen Barlow, financial advisor with Raymond James and Chamber/Bureau member, will discuss tax issues, the benefits for employee retention and the investment options within these programs. It was a busy and fully booked September with a number of events on offer to Chamber/Bureau members, including a session on Facebook for Business with Face It! Social Media and the quarterly Chamber 101 & New Member Lunch. 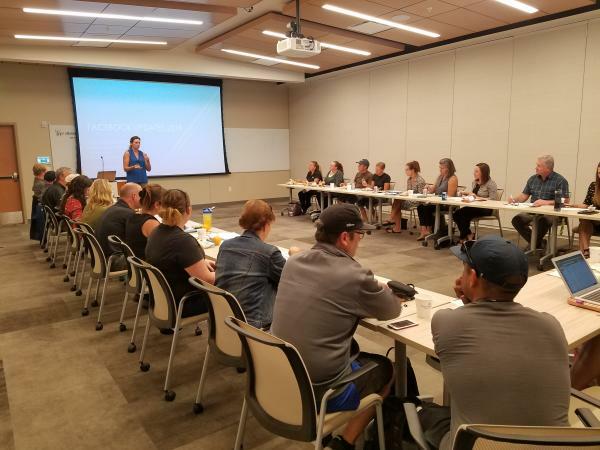 Chamber Members were treated to lunch at the Park City Hospital while discussing recent changes to Facebook that to help navigate the social media site more effectively. Alternatively, new members took time out of their busy day to learn more about Chamber Member benefits. Make sure to check in with the Chamber Member Event Calendar for upcoming opportunities in networking and member benefit seminars. Enlighten Wellness is a holistic approach to wellness. I have worked in the medical field for 9 years and realized that everyone wants a quick fix with medication. I also noticed when I worked in skilled nursing facilities, which is primarily for medicare patients and patients over 65, we were admitting patients as young as 35 with addiction problems and mental illness. I felt that we needed to get to people at a younger age and promote healthy living and help people work on their mental health. How long have you been in Park City? If not long, where did you move here from and what brought you to Park City? I have lived in Salt Lake City my whole life but knew Park City was the place to start this business. Tiffany Harrison my business partner and long time friend has lived up in Park City for the last year but has tought in Park City as a yoga instructor and personal trainer for many years. She started Wasatch Back Betty&apos;s 5 years ago and we just renamed it to Back Country yogis this spring. She knew that there was a need for this type of business and started out small but knew that there are many people who seek these types of activities. They want to get out of the city and recharge in the mountains where much healing happens. Tell us a little bit about your philosophy of yoga and how it fits into everyone’s lifestyle. Yoga along with all of our other services we offer helps people find balance in their lives. With yoga it promotes mindfulness and peace. The personal training aspect of our business is to help get people prepared for the outdoors with Back Country Yogis. It promotes strength and being mindful of how their bodies are feeling. We want everyone to know that they are capable of doing anything. What are some of the more unique places you chose to teach the Backcountry yoga? Enlighten wellness along with Back Coutry Yogis is dedicated to helping people find balance with mind, body, and spirit. We will be providing yoga, meditation classes, personal training, group training, massage therapy, and energy healing. We will also be having monthly educational classes that will differ each month in regards to healthy living. It is an all in one approach. We offer outdoor hike/yoga, paddleboard yoga, and snow shoe yoga with Back Country Yogis to take people in nature which helps people find more balance with mind, body, and spirit. We mostly take clients to the Uinta&apos;s to get away from motorized vehicles on the lakes for paddleboard yoga. There are also more places in the Uinta&apos;s to do our hike/yoga classes. We want each of these experiences to be unique to anyone coming to our classes. As a Chamber member, what are some of the programs available to members that you find as an asset to your business? The chamber has helped us in so many ways by promoting our business and getting locals vacationers to come and join our events. It has been great to get to know other chamber members and we feel that you have provided us with great support! We thank you for this. 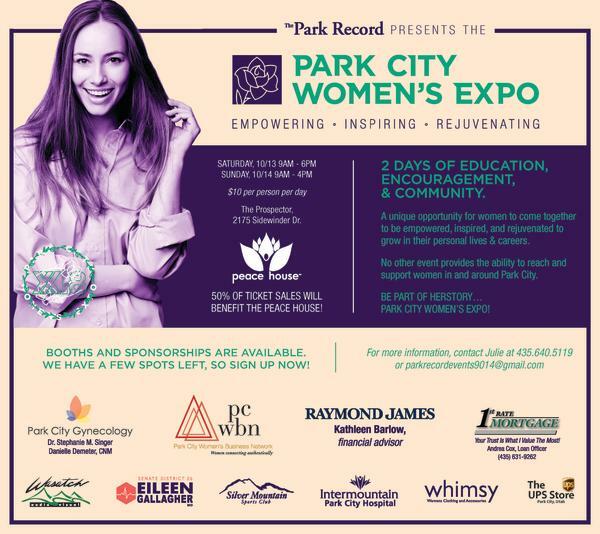 Sponsors include Raymond James Financial, Park City Women’s Business Network, Park City Hospital, Silver Mountain Sports Club & Spa, Whimsy Clothing & Accessories, Park City GYN - Dr. Stephanie Singer, Eileen Gallagher for Utah State Senate, and 1st Rate Mortgage-Andrea Cox. The PC Women’s Expo offers two days of education, support and community featuring booths, stage presentations and “how-to” tutorials including a women candidates panel discussion, financial advice, intuitive practices for everyday life, self-defense, literary anecdotes, fitness, health and nutrition, the importance of sleep, business help, career support, cooking, hair, make-up, proper bra fit, beauty demos, fashion shows, hand treatments and seated massage, car maintenance instruction, floral arranging demos... and much more! 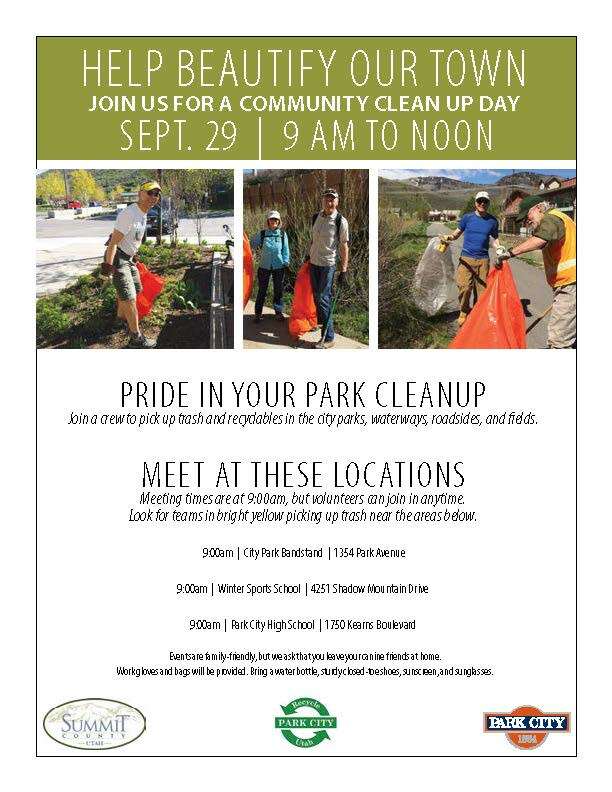 Help beautify our town September 29th, 9 am to noon and take pride in your Park! Multiple meeting locations are available. This is a family-friendly event, but please leave the pets at home. Please join the Wives of the Park City Police Department as we show our community appreciation to our local Law Enforcement Officers. “Paint the Town Blue” by decorating your businesses and homes in blue for the entire day of October 6, 2018. Click here for the event flyer and full details. There is never a dull moment in Park City! This is the most challenging calendar to keep updated because there is something to do every day! Below is a list of a few of the upcoming local events. Click on the links below to see what&apos;s going on around town with our various member partners!